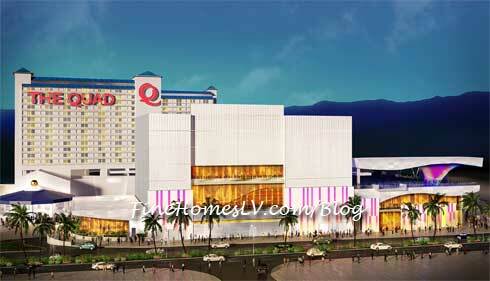 The infamous center-Strip resort formerly known as Imperial Palace will officially begin operating as The Quad Resort & Casino by Dec. 21, 2012, with renovation plans scheduled for completion by late 2013. Interior and exterior renovations to the property are already underway. The renovations are scheduled to be completed in phases and will bring improvements to the exterior façade, porte cochere, front desk, bell desk, hotel lobby, casino floor, retail promenade and dining levels. The new porte cochere will make its debut at the property next week and is expected to greatly improve congestion along pedestrian walkways as well as vehicle access to the casino. Caesars Entertainment officials announced the rebranding plans in early September. Please note the updated listings below and utilize the property’s new name going forward. The Quad is home to 21 meeting rooms, totaling more than 40,000 square feet. Each meeting room is capable of accommodating 10 to 900 people. Presented by comedic icon and Strip headliner of more than 25 years, Frank Marino, Divas Las Vegas is a 75-minute energetic and over-the-top production featuring 16 male, lady look-alikes impersonating some of music and entertainment’s biggest superstars including Cher, Beyonce, Diana Ross, Britney Spears, Lady Gaga, Shania Twain, Celine Dion and Tina Turner. The show performs nightly at 10 p.m. and is dark Friday. Las Vegas-based entertainer and world champion juggler, Jeff Civillico, entertains and wows audiences in his brand new show. A dynamic entertainer, Civillico’s show blends comedy with physical humor, stunts and juggling with friendly audience interaction and insane amounts of energy. Although he is a world champion juggler, it’s his zany personality and youthful spirit that create this unforgettable entertainment experience great for all ages. The show runs Wednesday, Thursday, Saturday and Sunday at 2 p.m.
Voted one of the Top Five Most Romantic Restaurants in Las Vegas by Best of Vegas, this warm and intimate eatery offers an extensive wine list and delectable menu of steak and seafood specialties including steaks, chops and surf and turf. Open Wednesday through Sunday 5:30 p.m. to 10:30 p.m. Known for its creative menu offerings, oversize portions, unique presentation and flavorful dishes using only the freshest ingredients, Hash House A Go Go offers guests an unforgettable dining experience. The menu features their spin on traditional breakfast favorites such as their signature farm scrambles, one-pound stuffed burgers, colossal salads and innovative dinner dishes such as their Andy’s crispy Indiana style hand hammered pork tenderloin. Open Sunday through Thursday 7 a.m. to 11 p.m. and Friday and Saturday 7 a.m. to 1 a.m.
Home of the daily brunch, Emperor’s Buffet serves up generous portions of a wide variety of dishes. From salads and sides to entrées and desserts, the combinations are endless. Guests at the Emperor’s Buffet will certainly find something tasty that will satisfy their every craving. Open daily from 7 a.m. to 2 p.m.
Voted “This Week’s Best” by AOL City Guide: Las Vegas, the traditional burger-joint offers half-pound burgers, fries, soft drinks and other tasty treats. Open Monday through Friday from 11 a.m. to 10 p.m. and Saturday and Sunday from 10 a.m. to 10 p.m.
Betty’s Diner features specialty coffees, sandwiches, soups, bakery delights and ice cream treats – the perfect place to stop to catch a quick bite to eat in the morning or a snack before bed. Open 6 a.m. to 2 a.m. daily. Ginseng 3 is a traditional Korean restaurant that serves up an exotic mix of Japanese and Chinese food as well. The menu includes everything from sushi and Korean barbeque to beef with broccoli. Open 24 hours daily. For the guests who are seeking traditional Mexican cuisine, Quesadilla specializes in classic south-of-the-border favorites including tacos, burritos and enchilada combinations. Guests can quench their thirst with mouth-watering selections of classic margaritas, mojitos, sangrias and other specialty cocktails. Open Friday through Tuesday from 4 p.m. to 10 p.m.
An outdoor pool and heated spa that is open seasonally. The pool opens daily from 8 a.m. to 7 p.m. starting in March. The poolside bar features tropical-themed drinks served daily. During Luau season the pool closes at 5 p.m. on Tuesdays and Saturdays. The Salon specializes in hair, bridal hair, make-up, manicures and pedicures. Open 9 a.m. to 5 p.m. daily. The simple yet elegant new design of the Skyline chapel creates the perfect setting for a unique and intimate ceremony. Surrounded by voile sheer curtains with custom color-changing backlighting, couples can illuminate the chapel with the hues of their choice. Incorporating the iconic backdrop of the famed Las Vegas skyline, this chapel features dark wood flooring accented with a beautiful island runner and seats approximately 80 guests. From over-the-top to simple and elegant, couples can plan the perfect ceremony with quirky additions such as “liquid courage” shots, showgirls, celebrity impersonators and matching couples tattoos for a truly one-of-a-kind Vegas experience.